Forensic science students at every degree level must have a basic background in biology and chemistry. in forensic science often require that students have a bachelor's degree or relevant work experience in the criminal justice field. Course subjects often include the basics on forensic science, investigative techniques, and criminal psychology. programs require courses in biology, chemistry, math, forensic science, legal proceedings, and report writing. Students within an associate degree program often concentrate their studies in forensic computer science, crime scene investigation, or forensic accounting. programs offer broader training in forensic science. Students can concentrate their studies in forensic chemistry or forensic biology. Many people with a bachelor's degree in forensic science move on to graduate school. 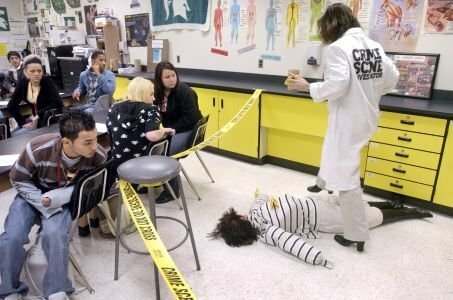 programs give students the necessary education for in-depth crime scene analysis, with the option to concentrate their studies in forensic anthropology, chemistry, or biology. Graduates of these programs have the necessary theoretical knowledge and technical proficiency for advanced forensic science careers. Associate programs in forensic science integrate the study of criminal justice, law enforcement, and natural science principles. Program applicants need a high school diploma or a GED. The 60-credit program can be completed in two years of full-time study. The curriculum in this program includes classes in crime scene safety, biological evidence, fingerprint identification and development, laboratory methods, and criminal law. Other common courses discuss interview and interrogation, quality assurance for evidence, crash scene investigation, constitutional law, forensic entomology, forensic anthropology, computer data recovery, impression evidence, and digital video evidence. Students learn how to assess a crime scene and collect evidence without disturbing potential valuable information. Students are also expected to take a number of classes in general studies subjects, such as English, mathematics, physics, biology, technical writing, critical thinking, psychology, and chemistry. Current law enforcement agents can use the associate forensic science and crime scene investigation program to expand their role as an officer and become a crime scene investigator. The associate degree program can also be used to launch a career in law enforcement, although most crime scene investigators and detectives have many years of professional experience. Graduates may be eligible for entry-level forensic lab technician positions, depending on the individual lab's hiring policies; however, many labs require that forensic technicians have a bachelor's degree. The University of Dundee is a university based in the city and Royal burgh of Dundee on the east coast of the central Lowlands of Scotland.